This is the back end of a processing plant for vegetables in Burscough, Lancashire, UK. If you wonder why you have never seen a crooked carrot in your local market, commercial or natural, this is why. Vegetables are ruthlessly sorted to conform to “quality standards” set by the food chain, and this is the result. Some is carted off to piggeries, some as you can see is already rotting in the water. Losing food to one waste heap or another is an issue in both high- and low-income countries. In places where income is low, wastage is generally unintentional and occurs earlier in the supply chain—food rots on farms or spoils during storage or distribution. In regions of higher income, willful food waste dominates farther along the supply chain. Retailers and consumers reject food based on bumps, bruises, and coloring, or simply order, buy, and serve too much. There are numerous and varied ways to address key waste points. In lower-income countries, improving infrastructure for storage, processing, and transportation is essential. In higher-income regions, major interventions are needed at the retail and consumer levels. National food-waste targets and policies can encourage widespread change. Beyond addressing emissions, these efforts can also help to meet future food demand. Impact: After taking into account the adoption of plant-rich diets, if 50 percent of food waste is reduced by 2050, avoided emissions could be equal to 26.2 gigatons of carbon dioxide. Reducing waste also avoids the deforestation for additional farmland, preventing 44.4 gigatons of additional emissions. We used forecasts of regional waste estimated from farm to household. This data shows that up to 35 percent of food in high-income economies is thrown out by consumers; in low-income economies, however, relatively little is wasted at the household level. labor force [in] production of food: Prakash, A., and M. Stigler. FAO Statistical Yearbook. Rome: Food and Agriculture Organization of the United Nations, 2012.
a third of…food [is wasted]: FAO. Global Food Losses and Food Waste: Extent, Causes, and Prevention, Rome: Food and Agriculture Organization of the United Nations, 2011. Hunger [afflicts] 800 million people: FAO. The State of Food Insecurity in the World 2015, Rome: Food and Agriculture Organization of the United Nations, 2015.
food…waste…emissions: FAO. Food Wastage Footprint: Full-Cost Accounting, Rome: Food and Agriculture Organization of the United Nations, 2014. Ranked with countries…third-largest emitter: FAO, Food Wastage. Sustainable Development Goals [for] food waste: United Nations Sustainable Development Goal 12.3. http://www.un.org/sustainabledevelopment/sustainable-consumption-production/. labeling on food packages…unregulated: FAO. Toolkit: Reducing the Food Wastage Footprint. Rome: Food and Agriculture Organization of the United Nations, 2013. Feeding the 5000: Royte, Elizabeth. “This Free Feast for 5,000 Was Made from Food Waste.” National Geographic. May 10, 2016. United States…food-waste target: Aubrey, Allison. “It’s Time to Get Serious About Reducing Food Waste, Feds Say.” National Public Radio. September 16, 2015. France passed a [food waste] law: Chrisafis, Angelique. “French Law Forbids Food Waste by Supermarkets.” The Guardian. February 4, 2016. Italy followed suit: Kirchgaessner, Stephanie. “Italy Tackles Food Waste with Law Encouraging Firms to Donate Food.” The Guardian. August 3, 2016.
where food waste is greatest: FAO, Food Wastage. Ranked with countries, food waste would be the third-largest emitter of greenhouse gases globally […]. Project Drawdown defines reduced food waste as: minimizing food loss and wastage from all stages of production, distribution, retail, and consumption. This solution replaces current reported trends in food waste by region. Estimates suggest that 30–40 percent of all food produced worldwide is wasted across the supply chain (Smith, P. et al., 2014). When food is wasted, all the energy, resources, and money that went into producing, processing, packaging, and transporting it are wasted too. The further down the supply chain the food gets before it is thrown out, the more resources are wasted to get it to that stage. If measures are taken to reduce food waste by improving storage and transport systems, generating public awareness, and changing consumer behavior, this solution could lead to substantial reductions in waste and carbon emissions. To evaluate the impact of reduced food waste, an independent model was created outside Drawdown’s core model framework to project food consumption and waste from 2020-2050. This was required due to the complexity of estimating country- and regional-scale food consumption and waste trends based on reported commodity types along the supply chain. Total food loss and wastage is calculated according to regional estimates of waste generated at each supply chain stage  (FAO, 2011), applied to aggregated country-level food demand by commodity type. Current adoption  of reduced food waste is considered to be zero percent. Impacts of increased adoption of reduced food waste from 2020-2050 were generated based on three growth scenarios, which were assessed in comparison to a Reference Scenario where the solution’s market share is fixed at the current levels. Adoption scenarios in this model grow linearly over time starting from the base year of 2014, and are considered “complete” in 2050. Linear growth trends were chosen because of the lack of country or regional data; additional behavioral research at more granular scales can reveal more representative adoption estimates. Plausible Scenario: This scenario assumes that a 50 percent reduction in total global food loss and wastage will be achieved by 2050. Drawdown Scenario: In this scenario, a 75 percent reduction in total global food loss and wastage by 2050 is modeled. Optimum Scenario: Aligned with the Zero Hunger Challenge of eliminating food loss and wastage, this scenario assesses the impacts of a 100 percent reduction in total global food loss and wastage. To estimate emissions, commodity-specific carbon dioxide-equivalent per-calorie values were drawn from several sources (see Audsley et al., 2010; Heller and Keoleian, 2014; Hoolohan et al., 2013; Tilman and Clark, 2014; Vieux et al., 2012) to determine minimum, average, and maximum estimated emissions factors per commodity. The emissions factors were multiplied by the baseline annual food demand by country and commodity to get the carbon dioxide-equivalent values for food items over time. Emissions estimates were aggregated by commodity types  and regions classified by the FAO (2011), and are aligned with regions used by Project Drawdown. FAO regional estimates of food loss and wastage by commodity types across the supply chain stages were applied to aggregated emissions values associated with regional food demand. Emissions reductions were calculated based on the incremental adoption of reduced food waste according to the Plausible, Drawdown, and Optimum Scenarios, which was applied across all stages of the supply chain. Resulting emissions reductions were aggregated to represent the total global reduction from avoided agricultural production. Project Drawdown calculated the total reduction in food loss and wastage by weight (in million metric tons) by commodity type. It was assumed that reduced loss and wastage can be diverted to feed current and future undernourished populations. Diverted tonnage of food was used as an input in the Project Drawdown Integrated Yield Model, which combines all agricultural production models to determine the required yield to meet the estimated food and bio-based product demand on an annual basis. Results from all demand-side solutions, i.e. reduced food waste and plant-rich diet, determine the need for land conversion to cropland and grassland in order to meet future food demand. Emissions reductions associated with land conversion were applied to both reduced food waste and plant-rich diet according to the proportion of their contribution to diverted food supply. In addition, the results of reduced food waste were applied to solution models in the Materials Sector that utilize organic municipal solid waste. Between 2020 and 2050, the Plausible Scenario projects the total cumulative reduction of food loss and wastage to be approximately 22,160 million metric tons, resulting in the reduction of 70.53 gigatons of carbon dioxide-equivalent emissions: 26.17 gigatons due to diverted agricultural production, and 44.36 gigatons from avoided land conversion. The Drawdown Scenario reduces food loss and waste by 32,103 million metric tons, and sees a total of 83.02 gigatons of emissions avoided. Finally, the Optimum Scenario sees a 41,287 million metric ton reduction, resulting in 93.72 gigatons of emissions avoided. Food loss and waste has many negative economic and environmental impacts. The global economic, environmental, and social cost of food wastage is estimated at USD$2.6 trillion, which is nearly equal to the GDP of France (FAO, 2014). Food waste generates unnecessary greenhouse gas emissions and wastes both water and land, negatively impacting natural ecosystems. Reducing food loss and waste can also help close the over 60 percent gap between food available today and food needed in 2050, thereby working toward eliminating hunger. Although solutions at consumer level are difficult to implement and hard to measure, they must be pursued at regions with high levels of consumer food waste. Food loss and waste measurement tools must be developed to standardize the measurement and reporting. Food waste reduction targets should be set not only at country levels, but also broken down to corporate, supplier, and consumer levels. Incentives for waste reduction should be designed and provided to influence behavior change. Reducing food waste is a big physical problem. But it has widespread benefits for the economy, the environment, society, and human health. The projected dietary changes show significant impacts for countries like India and China, whose populations are expected to demand more carbon-intensive foods over the next 30 years. Supply chain stages are defined as: agricultural production, postharvest handling and storage, processing, packaging, distribution, and consumption. For more on Project Drawdown’s three growth scenarios, click the Scenarios link below. For information on Food Sector-specific scenarios, click the Sector Summary: Food link. Commodity types include: cereals, roots and tubers, oilseeds and pulses, fruits and vegetables, meat, fish and seafood, and milk. Landfills are a top source of methane emissions. 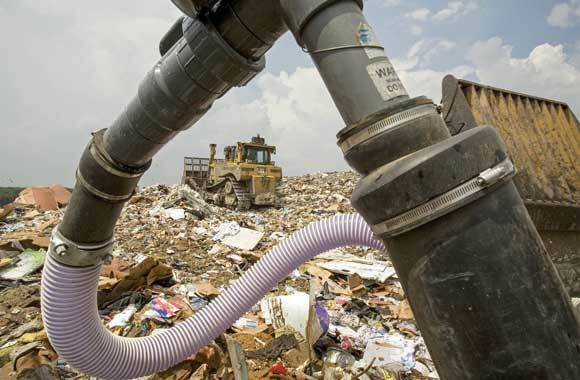 Instead, landfill methane can be captured, preventing emissions, and used as a fairly clean energy source. 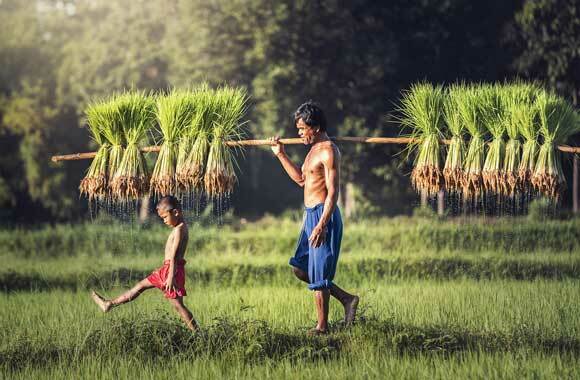 Flooded rice paddies produce large quantities of methane—10 percent of agricultural emissions. Techniques exist to reduce methane, while improving production and sequestering carbon.